The F-TYPE roars right from its heart. Its Sport Exhaust growls powerfully from startup, building to a race-car inspired crescendo. An Active Sport Exhaust, standard on the F-TYPE S and R, uses Active Bypass Valves to allow exhaust gases to exit more directly for a deep, dramatic sound. 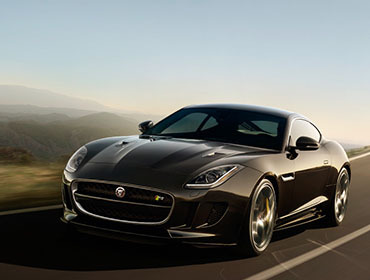 F-TYPE S AWD and F-TYPE R models feature Jaguar’s sophisticated Instinctive All Wheel Drive® with Intelligent Driveline Dynamics, offering balanced poise and confident handling. For the driving enthusiast, the F-TYPE, Premium and S models offer a manual gearbox. This close ratio 6-speed lightweight unit is specifically designed for the performance requirements of sports car driving. The QuickShift automatic transmission is both fast and smooth. The gearbox’s control system is intelligent and adaptive. Available on every F-TYPE, eight closely spaced gear ratios keeping the engine in its most effective operating range. 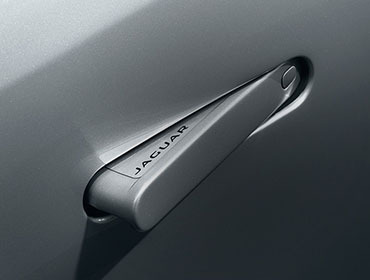 The F-TYPE door handles retract when not required; their flush design creates an uninterrupted flow along the flanks. Ready to pounce – sweptback headlights impart a feline intensity. Their elongated shape melds into the aerodynamic lines of the F-TYPE to make them visible from both front and sides. Bi-function high-intensity discharge (HID) xenon headlights provide an intense white light for both the low and high beams in a single unit, while J-Blade LED running lights create a distinctive signature. A front splitter beneath the grille and rear valance manage airflow underneath the car, while a deployable rear spoiler automatically rises at speeds over 60 mph on Convertible models and 70 mph on Coupe models to reduce lift by up to 264 pounds.3 AWD models feature a unique body kit, including body-color hood vents, side skirts and trim around the exhaust pipes. Easily select climate control, GPS navigation, audio choices or Bluetooth® telephone connectivity on the crisp color 8-inch Touch-screen in the F-TYPE center console.5 Manage multimedia connections on the screen, including iPod® or MP3 players. Select details of playlists and music displayed by artist, album and genre. The Touch-screen also controls the Configurable Dynamics System on S and R models. Working in harmony with its sports car nature, F-TYPE has advanced technology features to ensure you’ll be constantly connected and always entertained. Using state-of-the-art technology and precision built sound systems, the F-TYPE connects, informs and entertains in distinctive style. Jaguar offers three sound systems designed to please the most demanding audiophiles: a Jaguar system, powered by an 80W amplifier, and two others that have been created by British audio experts Meridian™. The first has a stunning 380W amplifier, the second offers an impressive 825 watt surround sound System, delivering state-of-the-art sound quality through 17 speakers. Both use advanced signal processing to deliver pin-sharp audio-reproduction. With a tap of the finger, the F-Type can transport you to a concert hall, a dance club or a stadium. Push the start button and the F-TYPE comes alive with a cascade of light from the console’s switchgear. Configurable Lighting, standard on the F-TYPE S, F-TYPE R and SVR, adds unique personalization, with choices of Phosphor Blue, Pale Blue, White, Coral or Red to suit your mood. Activate Dynamic Mode and the lighting switches to vibrant Red on the door grab handles, center console and instrument cluster. See farther and make nighttime driving better with Adaptive Front Lighting.4 This advanced system measures vehicle speed and the angle of the steering wheel, swiveling the lamps by up to 14 degrees outward, and up to 7 degrees inward, for improved visibility during cornering. 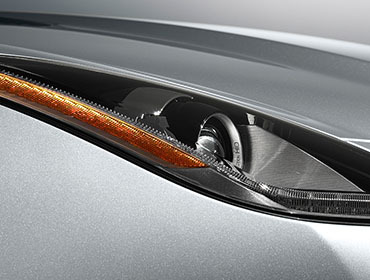 The included Intelligent High Beam system automatically switches between low and high beams as necessary. By monitoring how quickly you depress the brake pedal, the standard Emergency Brake Assist is designed to increase brake pressure in order to help shorten stopping distances. This system can also help the driver retain steering control under these severe braking conditions.